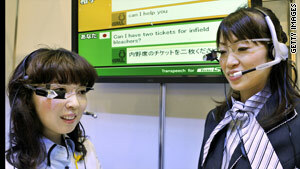 NEC has developed a piece of tech for real-time translation. IBM and Google aim to break language divides on the net. (CNN) -- Communications technology has shrunk the globe, but there remains one large boundary to all this togetherness: language. So far businesses can only spread as far and as fast as they can find people speaking a common tongue. However, researchers at IBM may be about to punch a hole through this barrier. The multinational currently has 100 staff working on an internal project named "n.Fluent" that offers instantaneous translation across a variety of platforms. "We have a web page interface, where you type in a URL and it automatically translates the web page for you," Salim Roukos, chief technology officer for translation technologies at the company's T.J. Watson Laboratory in New York, told CNN. "We also have an app that you can put on a web page and when users arrive... they can pull down a menu and change the language. "The ability to translate URLs is something that our customers love a lot, because once you translate the page, you can click on all the links and suddenly you are exploring the foreign language web as an English speaker." At the moment the software is still in development and only available with IBM, but the company's intention is to take the project to market. They are also developing versions for instant messaging and mobile devices. Imagine if there was a tool built into the search engine which translated my search query into every language and then searched the entire world's websites. "n.Fluent" began in 2006 as one of 10 innovations sponsored by IBM's chairman Samuel J. Palmisano. The company decided that the language barrier was a key issue, both for global businesses and companies with clients worldwide and so resolved to find ways of addressing the problem. "The core technology... is work in progress, but it is significantly advanced that for many languages we can do accurate translations," says Roukos. But IBM is not the only tech giant convinced that language is the next barrier to be broken online, and Google are currently working on a tool that will translate not only web pages -- but web searches as well. At the moment Google only searches English words on web pages when given an English-language query, but the company hopes soon to be able to open up sites of any language to users. "Imagine what it would be like if there was a tool built into the search engine which translated my search query into every language and then searched the entire world's web sites," Google's vice president Marissa Mayer told the UK's Daily Telegraph newspaper recently. "And then invoked the translation software a second and third time -- to not only then present the results in your native language, but then translated those sites in full when you clicked through." Away from the Internet, NEC are hoping their new device, the Tele Scouter will mean conversations won't get lost in translation. Unveiled last November the device is a set of headsets and glasses that can automatically translate spoken words and display them on a tiny retinal display. Still a prototype, NEC believes it could be used by technicians to translate manuals. Vernacular and jargon can be particularly problematic for translation software, so "n.Fluent" has been designed to learn from its mistakes and pick up specific terms used within IBM. To do this the project has been opened up to all 400,000 staff working for IBM around the world, and uses this "crowd sourcing" to access their expertise to feedback on the project. Over a two-week period in October last year IBM launched a "worldwide translation challenge" to its workforce, which resulted in two million words of text being translated. Incentives in the form of charitable donations and other prizes were offered to staff who took part. "Every single interface has a pop-up window, so if you happen to be bilingual you can make corrections," David Lubensky, an IBM specialist in the "real-time" aspect of translation systems, told CNN. "Many IBM-ers have more than one language, so we can get them to translate and use that to improve the quality." IBM believes the technology will be particularly useful for companies that produce a large amount of support content, such as technical manuals. These tend to be dynamic, as new bug fixes are found or updates added, and they also need to be accessible to a multi-lingual customer. Rapid, accurate translation of such literature published online can deflect calls from call centers, and bring significant savings. Alternatively, when a company has its workforce spread across the world "n.Fluent" hopes to allow documents from a client that arrives in one language to be quickly assessed by a geographically dispersed team. "So far we are much better at Spanish, French, Arabic and Portuguese," says Roukos. "It's harder for languages like Japanese, Chinese, and Korean, but we're working on it. "It's not only the sentence structure, but also how explicit the language is. There is a little bit more assumed from the context in Chinese and word order can change." Although "crowd sourcing" has proved extremely effective for IBM during the development of "n.Fluent", there are still aspects of working remotely with huge numbers of people that can be improved. "There are two challenges," says Lubensky. "Firstly, getting a sustainable, enthusiastic community can be difficult. The goal is to have an ongoing interest, to make it part of the fabric. "The second issue is quality assurance of content; how useful is the feedback, how many mistakes do people make and how much impact will they have?" Whoever wins the fight for market share, be it IBM, Google or others hoping to close the language divide, advanced translation software looks set to make a huge splash and businesses should get ready: it looks like the world may be about to shrink yet again.